Metabolomics using NMR spectroscopy is now a well established technique for obtaining information regarding the metabolic profile of body fluids, tissue extracts and tissues. “Metabolomics/Metabonomics: is a quantitative measurement of time related multi-parametric metabolic responses of multicellular systems to pathophysiology, exogenous or endogenous stimuli or genetic modification”. Its potential of joining genomics, transcriptomics and proteomics, provides extensive information about a living system which can be further utilized in drug development, diagnostics and health screening. Under pathological conditions some of these genes and proteins either get up-regulated or down-regulated resulting in the derangements in concentrations of various metabolites or altered metabolic pathways result in new molecular entity suitable for diagnostic evaluation. Similarly, plant metabolomics is more complex and NMR spectroscopy is a commonly applied technique in plant metabolomics and has been used to analyze a range of chemically diverse metabolites including catechins, aliphatic compounds, aromatic compounds, organic acids, phenolics, fatty acids, steroids, sugars and bioactive molecules from the plant extracts. Our group is basically involved in metabolic profiling in body fluids and tissues in human diseases such as cancer, parasitic, bacterial infections and in spinal cord injury (SCI) with followup treatment in order to identify significant metabolic confounders correlating the disease state. In plant metabolomics our group is involved in identifying bioactive secondary metabolic entities in medicinally and economically important plants. 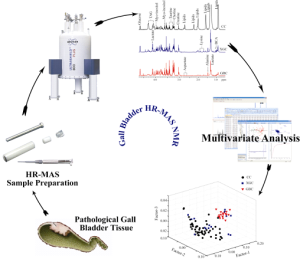 Figure: An example of Metabolomics of tissue specimens in Gall Bladder Cancer (Metabolomics 2013). One of the long standing goals in biology has been to understand life and life processes at molecular level. The completion of various genome projects has generated a wealth of information about the genomes of many organisms, including humans. Now, the next challenge is to understand what the genome contains and how theycontrolthe life. One way to meet this challenge is to assign and understand the functions offinal genome products i.e.proteins which are the real work-horses of the cell and are involved in every metabolic and biological activity of the organism. Therefore, deciphering the protein structures and functions are crucial for understanding life and life processes at molecular level. This has led to the origin of a new area in biology named “Structural proteomics” which aims at determining the three-dimensional structures of proteins on genome wide scale and then rationalizing their functional and mechanistic aspects. Proteins are the principal targets of modern drug discovery protocols as well.In fact, the key to understanding health and disease within an organism is to understand how its proteins function, because -rogue genes do not cause the disease- these are the rogue proteins which cause the disease. And when a protein is implicated in a certain disease, its structure, active site topology,and nature of interactions with its physiological binding partner(s), all-together provide the information to design a drug to interfere with the action of the protein, approach generally known rational drug designing process. Basically, a drug is designed to suppress the activity of protein involved in a particular diseased state. Nuclear magnetic resonance (NMR) spectroscopy is playing a strategic role in various structural proteomics and drug discovery endeavours allowing (a) three-dimensional (3D) structure determination of proteins, (b) screening of functional protein-protein, protein-nucleic acid or protein-ligand interactions, (c) characterization of their dynamics features at atomic level, all critically important to understand “how do these proteins function and how can their activity be altered?”. NMR spectroscopy has played a pivotal role in solving various problems in chemistry, biology, medical and pharmaceutical science. For any spectroscopic technique, the most critical parameters are sensitivity, resolution and speed. NMR has witnessed significant progress in improving sensitivity through the introduction of Fourier Transform methods, cold-probe technology, and high field magnets in recent years; however, resolution remains a bottleneck in getting atomic level information from macromolecules, in-cell metabolites, biomolecules, and metabolomic samples. 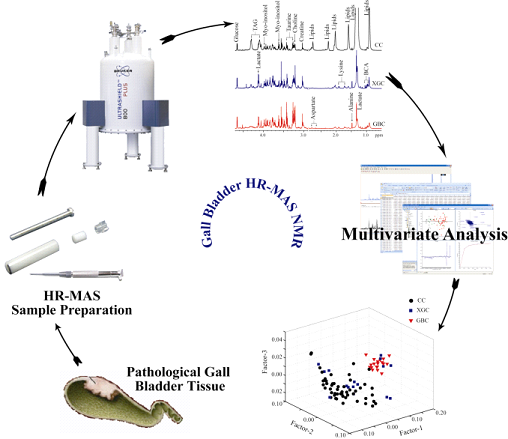 NMR based metabolomic studies permit detection of metabolites in only micro to millimole range concentrations in bio fluids. Further, signal overlap between individual metabolites is another outstanding concern in assignment of metabolites. Similar problems are encountered in in-vivo 1H MRS and biomolecular NMR. Proton has limited chemical shift range that leads to overlap of numerous resonances and in addition to that, J-splitting of peaks further aggravates the problem of overlap of multiplet components. Improvement of resolution until recently has been mainly dependent on raising the applied static field strength, and technological advances in this direction has been slow, and so far resulted in doubling the field (500 to 1000 MHz) for 1H in nearly three decades. Multidimensional NMR has provided a partial response in improving resolution, but, even at high fields 1H spectra displays significant overlap for aforementioned samples. If the multiplets could be collapsed to singlets, so that single signal per chemical shift appears in 1H spectrum, that would not only improve sensitivity but also resolution by an order of magnitude as a contrast to approaches such as magnet development which have contributed an improvement of a factor of only two in three decades. Therefore, the fundamental objective of our research is improving resolution and sensitivity and extending their novel applications in areas such as metabolomics, chiral analysis, and biomolecular studies.